Poll: What does the Housing issue mean to you? – Chocobo Construction Co. I saved for 7 months to be able to afford whatever housing was going to be available. What was given is beyond disappointment. I pictures neighborhoods with small house that could be colored and tailored to personal taste and a small plot of land. I don’t want an FC house and I have no desire to fight with FCs over land every time a new ward opens. This system was beyond lazy. No effort or thought was put into this housing system at all. If it beyond SEs developmental ability to create something similar to Wildstars or Star Wars the go back 10 years and give us mog houses with flowers pots. I have canceled my sub. If you’re quitting over something like this, good riddance. She made some valid points and explained how important having a personal house was to her. Different people play for different reasons. Since she was not getting what she wanted from the game, she chose to leave, which is a smart choice at the cost of losing an intelligent player from FFXIV. You on the other hand with your trollish attitude, no one will mourn your loss. My server doesn’t have a single plot left for sale. I’m waiting for a new district to open. I bought a personal house, but we sadly had to go with a smaller size than we initially expected after saving up for months. I was highly disappointed in the route they took, and I hope they find a way to make up for it. I would be all over Coerthas housing if they implemented it… and assuming I had that much gil to spend. Frankly, housing costs too much in general for everyone to enjoy it and; doesn’t have enough availability for those who don’t want to spend all day jumping back and forth between farming all day with the time they pay money for and struggling with the markets, especially if you’re not a three star crafter or gatherer.. which, most aren’t and frankly can’t afford either. The price tag of millions is added onto by another half million just to put the house up on the lot. Want to actually put things in it? Well.. you had better be a crafter whether you were interested in that branch of the game or not, because even the board prices are over-done. Availability is also a joke. New wards don’t open up quickly enough, and when they do, it’s never more than one. One of the large guilds on my server does a couple things that screw everyone else over. For one, they made more guilds, just so they could have more than one guild housing. I don’t even fully understand why they would bother doing it other than for cosmetic value and to say they did. The other thing is that they use the vast amounts of gil they make by selling primal and coil runs to people to buy out most of every ward in every district. Our FC was formed from some of the remaining members after our previous FC broke up, and we were planning to buy the large housing in Mist right next to where 4 of our other members had their personal housing. A member from the other guild bought it, with money from someone else, who taunted us before they did it. As of now, the only district that has any open slots is Ul’dah, and that only happened after 2.55’s story came out for obvious reasons. We do finally have our housing thanks to that, but all of our neighbors are never on, have almost nothing in their yards, and even have default house names still, so it’s a fairly dull, empty neighborhood aside from our own house. 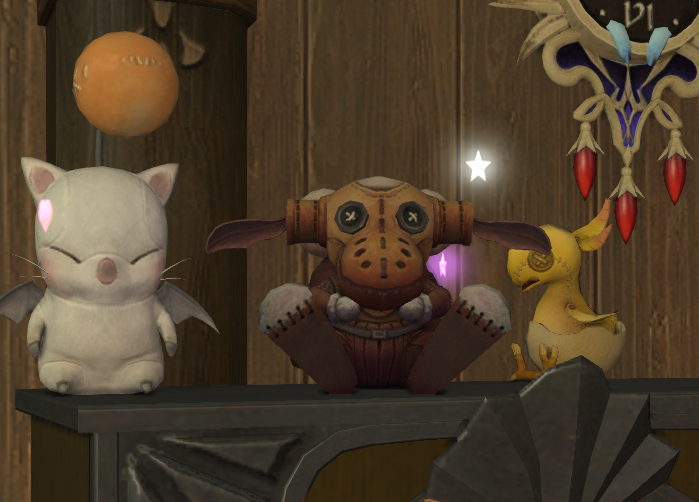 Moonfire Faire Furnishings! Been sick, but catching up!